KUALA LUMPUR (Dec 19): MCA-linked Matang Bhd, which is involved in the management of plantation estates, sales of fresh fruit bunches (FFB) and property investment, is projected to raise RM16.9 million from its initial public offering (IPO) exercise from its listing on the ACE Market of Bursa Malaysia Securities. As part of the IPO exercise, Matang will issue 130 million new shares of par value of 10 sen each, made available to the public at an issue price of 13 sen per share. 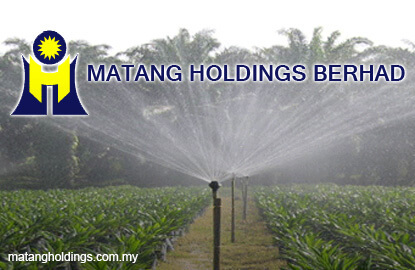 Matang chairman Datuk Teh Kean Ming said out of the total IPO proceeds, RM11.92 million or 70.5% will be used primarily for general working capital requirements to finance Matang and its subsidiaries' day-to-day operations over the next five years. Teh added that another RM2.55 million or 15.1% would be used to enhance its effectiveness in the operation of Matang Estate, RM250,000 or 1.5% for replanting exercise to improve the oil palm trees age profile and the remaining RM2.18 million or 12.9% will be used to defray listing expenses for the IPO. "Matang expects to see some of its oil palms, which were replanted over the past a few years, start yielding optimal level of FFB production in the near future. "Coupled with the current crude palm oil (CPO) at over RM2,900 per metric tonne and industry expectation of the average CPO price of above RM2,700 next year, the board believes there is potential for growth prospects for Matang," he said at the prospectus launch today. Moreover, the palm oil industry and its plantation segment have the full support of the Malaysian Government, which has singled out palm oil as one of the main sectors to help Malaysia achieve developed nation status by 2020. Based on the enlarged issued and paid-up share capital of 1.81 billion shares and IPO price of 13 sen per share, it will bring the company's market capitalisation to about RM235.3 million upon listing. Matang's listing is tentatively scheduled for Jan 17, 2017.